Nothing can make a person jump with excitement quite as much as hearing their favorite song. Especially when you’re at a concert that hails from the same era as the old favorite. Music is nostalgia after all, particularly for this Jackson-5 dancer! 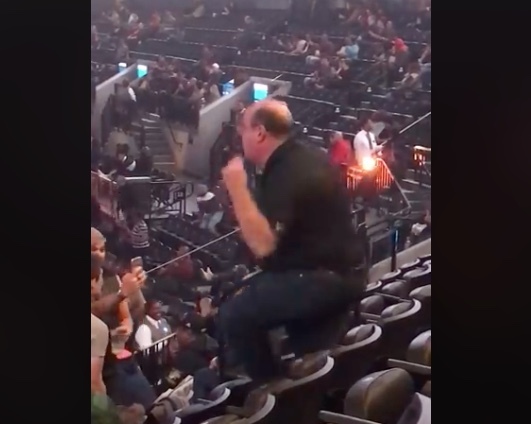 No one feels that more than this gentleman who was caught dancing on video at a Janet Jackson concert. On November 15th, Lashea Battle was taking in the setting of the show at intermission with her phone on Facebook live. The venue began playing the famous hit I Want You Back by the group Jackson-5. That’s when she caught Vic Picinich getting his groove on like it’s 1969! The man might be middle-aged, but as soon as he heard the old favorite playing from the speaker, he was a young kid again. The instant he recognizes the song, Picinich jumps to his feet and starts busting out moves so epic, you’d think he was trained! What makes this video so lovable is the feeling the California native puts into his impromptu dance! He’s got so much energy oozing through him, you can’t help but smile wide when you see it. What’s more amazing is the freedom with which he dances. As we grow up, most of us lose that bodacious attitude that allows us to grab life by the horns and ride the moment. Not this guy though! You won’t want to miss how he jumps to his feet in excitement, so give us a like if you love seeing stuff like this and continue to the next page! Wow this guy is awesome!